By Mary-Dell Chilton, Ph.D., distinguished science fellow and founder of Syngenta’s biotechnology research labs. 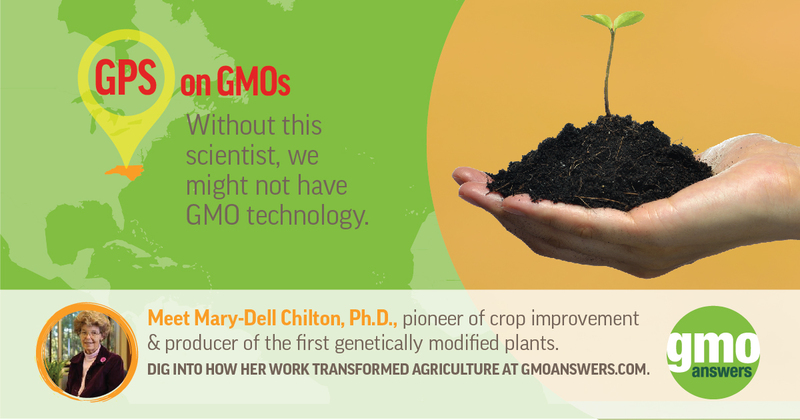 As part of GMO Answers’ GPS on GMOs series, GMO Answers is highlighting some of science and agriculture’s revolutionary female leaders and their research in specific parts of the world. The following post is the third installment of this series and highlights the leadership of distinguished science fellow and founder of Syngenta’s biotechnology research labs, Mary-Dell Chilton, Ph.D., who broke scientific and gender barriers to develop the first genetically modified plants. Growing up, my competitive personality and keen interest in science seemed to drive me to excel throughout my education from high school, to college and graduate school. In the late 1970s during my professorship at Washington University in St. Louis, I was privileged to be part of the research team that produced the first transgenic plants, an achievement that would transform agriculture as we know it today. Our team discovered that we could harness the genes in the bacterium Agrobacterium tumifaciens — a microbe that causes galls on plants — to insert other, beneficial DNA into the plant’s cells. This allowed us to use Agrobacterium as a means of DNA transfer, opening the door to genetic modification of plants in general. Scientists have now perfected this technique and as a result, we have crops that can resist insects, disease and harsh weather conditions; and crops that can be sources of valuable nutrition, for example Golden Rice and its potential to serve as a source of vitamin A. Many see this research as the defining moment that paved the way for some of today’s most advanced crop improvement technologies. I, too, celebrate the fact that genetic modification laid the foundation for many of the significant contributions plant biotechnology has made to agriculture today. This research, however, was not immune to the controversy that is often associated with such new technology. In fact, the reviewers of our publication were so astonished at what we found that they couldn’t believe their eyes! When I began my research in the late 1970s, there were lots of women in the university, but not so many were in chemistry. There were four of us in chemistry in my graduating class at Illinois. As women, it is critical that we continue to break through barriers in the scientific and research fields and that we continue to support and encourage other women to do so in all levels of academia. From the beginning, I’ve rarely thought about my gender and focused solely on my passion for science. For the last several decades, I’ve continued to champion and support the science behind genetic engineering as it has continually proved vital to our society and our planet. I’m honored to have been inducted into the Women in Technology Hall of Fame and to have been dubbed, “The Mother of Plant Genetic Modification” and the “Queen of Agrobacterium.” But there is still a long way to go as I believe the full potential of GMO technology has yet to be realized. Today, my work continues at the Syngenta laboratories in North Carolina where I focus on gene targeting. I also devote my time to scientific mentorship and leading the next generation of science revolutionaries, both men and women. My husband and I have opened our home over the years to numerous young scientists from many countries, both academic and interns at Syngenta. They have named our house the “Chilton Hilton.” Spreading enlightenment about the value and need for our work is one of my most important pursuits. I give young people today the same advice I’ve given throughout my career: Pursue what you love and what fascinates you and the rest will follow.